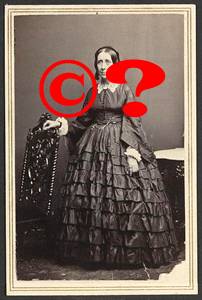 Earlier this week, reader Jes Lindsey asked a great question about a photo of a family member in a comment to an earlier post, and it’s such a great question — one others may have as well — that The Legal Genealogist is “promoting” it here to its own blog post. The first part of this question is: when Great Grandpa bought that photo, did he buy the copyright as well? Here, Jes says, the receipt for the photograph — a document in writing — says “all rights” were transferred, and it’s a receipt from the studio that created the original. All rights in this very specific context can hardly mean anything other than just what it says — all rights. So it sure looks like Jes’ Great Grandpa owned the copyright. The next question, then, is just what that meant: what exactly did Great Grandpa buy? So what exactly does Jes have today in terms of those rights? Can Jes safely use that photo to promote the photo restoration business? You already know what’s coming, don’t you? The lovely wonderful lawyerly answer of which The Legal Genealogist is so fond? First and foremost, the question is whether anybody has a copyright interest in that photograph any more. That’s answered by finding out — if it’s possible to find out — when the photographer died. If the photographer died more than 70 years ago, the photo isn’t copyright protected any more and Jes is perfectly free to use the photo in any way — for personal or commercial purposes. If the photographer died within the last 70 years, then somebody still has a copyright interest. The question then becomes who. And that’s not answered just by the fact that Great Grandpa gave Jes the photo, or even by the fact that Great Grandpa gave Jes the photo and the receipt. Remember, under the law, a transfer of rights has to be in writing, signed by the owner of the rights. Great Grandpa would have had to sign something giving the copyright to Jes — just giving up the photo or even the photo and the receipt doesn’t give up the copyright. If Great Grandpa did sign the photograph (edited:) and copyright over to Jes in a written document, Jes is home free, because Jes would own everything Great Grandpa owned and nobody else anywhere would have any claim to it. But if there is still a copyright in effect and Great Grandpa only handed over the photo without signing over the copyright, Jes needs to figure out exactly who owns the copyright today. And that’s a matter of the law of the state where Great Grandpa died, and what Great Grandpa did in terms of leaving a will, and maybe even how many other folks descend from Great Grandpa. • Did he mention the copyright specifically? • Did he mention this photograph specifically? • Did he mention photographs generally? • Did he mention personal property generally? • Did the will have a residuary clause (“and all the rest and residue of my estate I leave to…”)? • What state’s law controls how his personal property would be distributed to his descendants? • What does that state’s law say about who’s entitled to inherit personal property? • Who was alive when Great Grandpa died who would have been included in that group? • Who is alive today who might have a claim to any part of Great Grandpa’s personal property? And, of course, once those people or descendants who own the rights are identified, getting them all to sign off on the use of the photo is all Jes needs. Image: Brady’s National Photographic Galleries, Unidentified woman, possibly a nurse, during the Civil War, Library of Congress, Prints & Photographs Division, Washington, D.C.
Is this necessarily the case? Couldn’t Great-Grandpa have signed the ownership OF THE PHOTO over to Jes in a written document, without necessarily transferring copyright as well? Wouldn’t it depend on what the written document said about the copyright itself, and if it only mentioned the photo and not the rights, wouldn’t those still reside with his heirs as described in in the second half of the post? I thought that Jes wouldn’t own everything Great-Grandpa owned unless he specifically gave her (in writing) everything he owned – transferring the photo itself in writing wouldn’t be enough, and he could transfer some but not all rights in writing, if he so chose. Am I mistaken? I thought that was clear from the prior paragraphs, Kathleen, but so it can’t be misunderstood, I’ve edited the post to include signing the copyright over. Transferring the photo alone means nothing in terms of copyright. The signing-it-over would only transfer the copyright if it said so. Isn’t there the practical side of this issue that Jes should consider? If she goes through your questions and determines that it is likely that the photographer or his estate owns the copyright, should she not use the picture? I would think that the risk is so small that she should not worry about it. The copyright holder would have to visit the web site, identify the picture to be one for which (s)he holds a copyright, have sufficient damages to file a claim, and be able to prove their case. And, of course, Jes could communicate with the copyright holder to transfer the copyright or get sufficient permissions. If this were my web site, I would not lose sleep over using my ancestor’s picture. I am not suggesting that we should disregard copyright laws, but in this case (until I read your post) it would have never occurred to me to even think about it. In my book, it’s unethical to simply assume the copyright owner won’t catch you and foolish to assume the copyright owner won’t sue you if he/she does catch you. Here, there’s very little chance that the copyright is owned by the photographer or photographer’s estate, so on that count I wouldn’t lose any sleep. But if this is still under copyright protection, I wouldn’t risk my business by using the image without getting other family members to sign off if they do have an interest in the copyright. Great article, Judy. One of the (many) things I struggle with on copyright is the concept of “published” with respect to studio photography. A book published in 1890 in the US is no longer under copyright protection. It has passed to the public domain. The same can be said of the photographs in that book. What constitutes being “published” when it comes to photographs, particularly old (pre 1923) professional studio photographs such as Jes is in possession of? Does the sale of photograph to a customer constitute publication? As always, your insights would be very much appreciated! So, if I understand you correctly … if I want my children and their descendants to be able to use any photographs, paintings, or drawings I created, I need to add that clause to my will and in the mean time add an addendum. I also should do this for any written work. I learned the hard way that the photographer owns the photo copyrights of all the pictures he took of my children—now stored in a warehouse where he refuses to retrieve them. When my middle child was married, I knew better and made sure she had the copyright to her wedding photos included in the contract. I also have the copyright to photos taken of myself and my third child. However, I should take further steps and sign additional letters transferring copyright to my children and their descendants with full permission to use the photos as they wish, if I want them to be able to use them without restriction. I also think that the photographer taking my newborn grandchild’s portrait (a family friend) will need to sign a letter transferring copyright of the photos to my children. Her “gift” of these photographs is not going to fly in the eyes of the law. As sole heir of my mother’s estate, I’m not sure I have the legal right to use pictures that she took. It does seem that I do not have the right to use pictures taken of my family by others unless I can track down all living heirs and get their signed permission or wait until the photographer has been dead 70 years. Making sure you clarify all of the uses you want to allow of photos you’ve taken is a very good idea. A letter allowing your descendants to use the photos as you wish would certainly do that; saying the same thing in your will would make it clear as well. As for images your mother took, if you are the sole heir to her estate, then you own the copyright. As for using photos taken by others, getting permission is always the safest route to take, but there’s still the doctrine of fair use. Making a print for your own child is, I suspect, going to be treated by the courts much differently from publishing a copy on the cover of a best-selling book. I am belatedly catching up with my blog reading, and I hope that I am not too late to offer a different approach to answering this question then you have done. Prior to 1978, the default position for a studio photograph was that it was a work made for hire, with copyright belonging to the subject of the photograph. The fact that the receipt did not transfer copyright but rather stated that the copyright belongs to the purchaser seems to me to be confirmation of the work made for hire status of the photograph. And copyright duration for an unpublished work made for hire is 120 years, so an 1890 photograph would be in the public domain. It is easy to forget that the 1976 Copyright Act represents a huge reversal of traditional work made for hire doctrine, and that current rules regarding ownership, transfer, and duration would not apply. As always thanks so much for contributing your knowledge, Peter! Do I understand this right. If I get written permission from the author, photographer, creator I can use copyright materials in a new publication? Exactly right: you can do whatever the permission allows you to do including re-use, republish, etc. Judy, I thought this was a good article then, and it still is one, but it leaves me with unanswered questions about inheritance. There might be too much here. Scenario 1: Third cousin gives me digital copies of original studio photos that she scanned of my great-grandmother, her sisters, and their mother (our 2nd great grandmother). She inherited them from her grandmother. She gave me permission to put the scanned copies in my genealogical database attached to each person. She owns the copyright of these photos, correct? I would also assume that I can do nothing else with these photos without her permission, including printing them out and framing them to put up in my house. Scenario 2: My uncle died and his son, my cousin, was left with many photos that were either obtained by my uncle, copied by my uncle, or photographed by my uncle. My cousin gave those photos to another cousin, son of a different uncle. If my other cousin gives them to me, who on earth owns the copyright? Scenario 3: My uncle took photos and gave me copies. What are my rights with respect to these copies? He gave them to me not long after he took them years ago and now he is deceased. In each scenario, you would have to track the property right involved just as you would in a probate. You say in scenario 1 the cousin inherited the photos, but that doesn’t necessarily mean she inherited the copyright. The ownership of the thing (the photos) is separate from the ownership of the photos. IF she did inherit the copyright then what she gave you was permission, that is, a license. In scenario 2, the uncle’s copyright went to his heirs. If your uncle left a will, it would have been controlled by the will. If he didn’t, then it would have gone to whoever the intestate laws of his state dictated. If he had just one single son, then that one son (your cousin) owns the copyright. In the third scenario, you have only whatever permission your uncle gave you and nothing more. The copyright would have gone to his heirs.